BuzzFeed. Huffington Post. Twitter. Snapchat. We are living in a world of instant gratification. A world of “now you see it, now you don’t”. What’s considered “news” at 12pm is already an archived Reddit post by 5pm. People’s attention spans are getting shorter. Yet the list of two-minute Vine “movies” they’re watching is getting longer. In today’s world of wham-bam-thank you ma’am, how are we supposed to hold on to the things we find near and dear to our hearts? How are we supposed to share these treasured memories we have, if they are erased and replaced so quickly? For purposes of this article, I’m always tasting new wines and watching new films. But lately I’ve been feeling nostalgic. Lately I’ve been yearning for a little familiarity…a little comfort. And then I found it. Or more precisely, it found me. I was walking passed a sidewalk sale on Santa Monica Blvd. when I saw her. It was as if it was meant to be. This month’s movie is “SNOW WHITE AND THE SEVEN DWARFS”. Still ranked by the American Film Instittue as one of the 100 Greatest American Films, “SNOW WHITE AND THE SEVEN DWARFS” introduces us to the original Disney Princess. Snow White is pure, good-hearted, and loving. She represents all that is righteous and fair, even in a world full of evil queens and magic mirrors. Yes, were Snow White to be traipsing around the streets of New York City in 2015, you might think she’d be humming a different tune, but actually, I don’t think she would be. What Walt Disney created with Snow White was a simple heroine.. She doesn’t need special powers or hidden identities. In Snow White we believe that good will always triumph over evil. 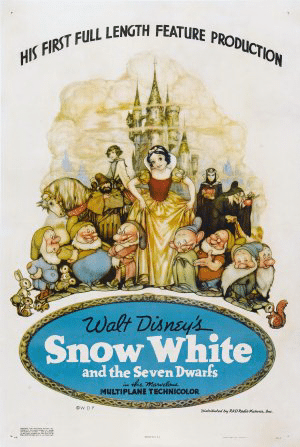 “SNOW WHITE AND THE SEVEN DWARFS” marked a turning point in the world of entertainment in 1937. Not only was it the first full-length animated feature film from Walt Disney Productions, but it was also the first of its kind. Before this animated classic came to be, animation was widely dismissed as crudely-drawn short films. This film almost never happened. Disney had to mortgage his home to raise the money for production. But not even Disney himself could have predicted how impactful Snow White would still be to this day. Einstein said it is the best film ever made. Snow White was the first fictional female character with a star on the Hollywood Walk of Fame. The staying power of Snow White’s character in modern film and television reminds us that if we stay hopeful, whistle while we work, and just believe, that we too can live happily ever after. What in the world was I going to choose for a wine pairing? It’s got to have a regal sort of class to it, don’t you think? It’s got to be simple, yet poignant. Powerful and yet delicate. And most importantly, it’s got to withstand the test of times. Easy. Enter the MADAME DE LA POMPADOUR BRUT ROSE SPARKLING WINE from DOMAINE CARNEROS, but most importantly, from EILEEN CRANE. The wine’s aroma, delivered on a delicate mousse, hints at wild strawberry, ripe peach, apricot, pomegranate, honeysuckle, and exotic spices. A blend of Pinot Noir and Chardonnay, this true Brut of a Rose is enjoyable at a young age, and yet will also gain wonderful complexity with aging. This wine, and all the wines at Domaine Carneros are under the watchful eye of EILEEN CRANE. Often referred to as America’s Doyenne of Sparkling Wine, Crane has spent over 35 years in the wine industry. She has been dubbed the most experienced sparkling winemaker in the United States. Not that there haven’t been obstacles along her way. Eileen Crane’s leadership has also been rewarded. No, she doesn’t have a star on the Hollywood Walk of Fame, but Forbes Magazine did recognize her as the Most Powerful Woman in Napa Valley. And with all her work in the Wine Industry’s Green Movement, she continues to receive awards for her green practices. At the end of the day though, it’s quite simple for Crane, “I still sit out on the terrace, most evenings, with a glass of wine.” And she lives happily ever after. A native New Yorker, Elyssa has been acting since the age of 5 (she still owns the red dress with the black bow from when she played Annie at the age of 6). After studying at the British American Drama Academy in England, and graduating from The University of the Arts in Philadelphia, Elyssa spent her time performing around the country in various theatrical productions....from Shakespeare's "As You Like It" and "Measure For Measure", to the long-running improvisational comedies "Tony 'n Tina's Wedding" and "Shear Madness"...with some other tricks of her trade along the way. Elyssa is a house performer, writer, and producer at The Pack Theater in Hollywood. Her most recent TV credits include "Silicon Valley" and "The Mindy Project".